A Desperate Tatter: The second motif. Here is all I am going to do from this pattern. It was just a sample and a trial to see if I could make the pattern turn out somewhat like the original picture. You can check for yourself to see how well I did. Here is the original pattern. What do you think? Did I come close? Well on to something different. 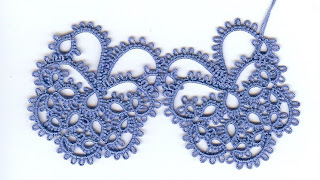 I have another pattern I want to try out. Look really good to me. Keep up the great work!!! You didn't follow the instructions? It looks perfect! Love the color too!!! This is a very pretty edging. I like your interpretation of it. What book is it from? It looks like one I'd like to try. 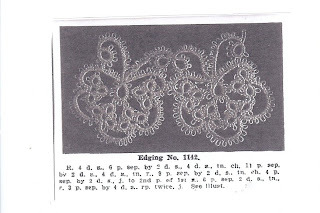 This is from Old and New Designs in Tatting by Sophie T. LaCroix Book No. 11. I found it at www.antiquepattern.org site.